Use Elegant Wedding to show the details of an upcoming wedding, display a simple countdown save the date site to build up excitement for the big day or if youâ€™re a wedding planner you can use it to showcase your business and advertise your services. Get your theme looking like the demo site in no time at all using the included one click demo content install! 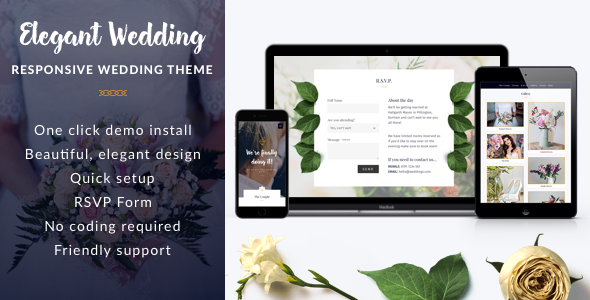 Elegant Wedding is built using the Unyson framework which includes an easy to use visual page builder and built in extensions to help set up your theme exactly as it appears on the demos.